50 Restyling & tRuck AccessoRies | March 2015 restylingmag.com doesn't work on social media, it's being inac- tive. If you are not posting, prospective cus- tomers can't see you. And with most people having smartphones, posting to Facebook or Instagram is just a couple of taps." Special Services and Vendor Networks In addition to printed promotional mate- rial, manufacturers oen make their internal design services and external network of mar- keting vendors available to their customers. Perkins says that, on occasion, the company will do offset printing work and even logo design or custom graphics for customers for use in marketing their liner products. 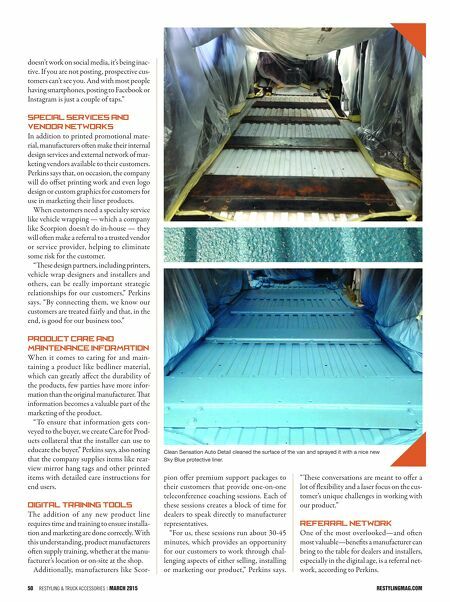 When customers need a specialty service like vehicle wrapping — which a company like Scorpion doesn't do in-house — they will oen make a referral to a trusted vendor or ser vice provider, helping to eliminate some risk for the customer. "ese design partners, including printers, vehicle wrap designers and installers and others, can be really important strategic relationships for our customers," Perkins says. "By connecting them, we know our customers are treated fairly and that, in the end, is good for our business too." 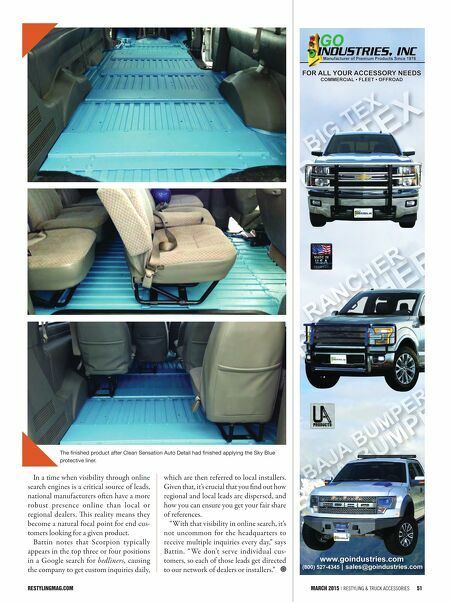 Product Care and Maintenance Information When it comes to caring for and main- taining a product like bedliner material, which can greatly affect the durability of the products, few parties have more infor- mation than the original manufacturer. at information becomes a valuable part of the marketing of the product. "To ensure that information gets con- veyed to the buyer, we create Care for Prod- ucts collateral that the installer can use to educate the buyer," Perkins says, also noting that the company supplies items like rear- view mirror hang tags and other printed items with detailed care instructions for end users. Digital Training Tools The addition of any new product line requires time and training to ensure installa- tion and marketing are done correctly. With this understanding, product manufacturers oen supply training, whether at the manu- facturer's location or on-site at the shop. Additionally, manufacturers like Scor- pion offer premium support packages to their customers that provide one-on-one teleconference coaching sessions. Each of these sessions creates a block of time for dealers to speak directly to manufacturer representatives. "For us, these sessions run about 30-45 minutes, which provides an opportunity for our customers to work through chal- lenging aspects of either selling , installing or marketing our product," Perkins says. "ese conversations are meant to offer a lot of flexibility and a laser focus on the cus- tomer's unique challenges in working with our product." Referral Network One of the most overlooked—and oen most valuable—benefits a manufacturer can bring to the table for dealers and installers, especially in the digital age, is a referral net- work, according to Perkins. Clean Sensation Auto Detail cleaned the surface of the van and sprayed it with a nice new Sky Blue protective liner.